Primitive-style decorating reflects a love of past days during Colonial times, when homes were decorated simply and with items that also had a useful purpose. Décor items were simple and not without flaws. A dent or chip did not make a piece of furniture unwanted. Today, primitive-style homes are decorated with things of the past as well new items. Newly-crafted dolls can be made primitive looking by using a grunge-and-stain technique to make them appear worn and old. Heat the water to boiling. Add coffee mix, and stir until the mix is completely dissolved. Add the cinnamon, nutmeg, ginger and vanilla extract. Stir until mixed. You will notice the spices will want to settle to the bottom like a gooey sludge. Lay out enough paper towels across the baking sheet to cover it. Use the paint sponge to begin painting the grunge mix over the doll’s surface. Pick up some of the spices as you paint to grunge the doll more. Bake the doll at 175 to 200 degrees Fahrenheit for 20 minutes. Turn it over and bake another 20 minutes; repeat this until the doll is dry. Rub over the patches of the now-dry spices to further grunge the doll. It's easier to grunge a doll before adding hair. You may wish to do the embroidery for the face or painting before staining so the shade or the thread or paint's appearance will match the doll's surface. You can also mix a 1/2 cup of unsweetened tea mix and 1/2 cup instant coffee mix for a different shade of stain. If you prefer a less grungy look, add only 2 tsp. of cinnamon and omit the other spices. You can switch out the vanilla for peppermint or maple extract to make other scents. 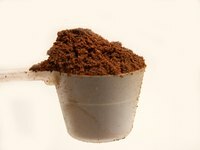 The coffee mix can stain clothing, so wear an apron or be careful not to splatter on your clothes. Do not leave the doll unattended in the oven; check it regularly to avoid over baking.